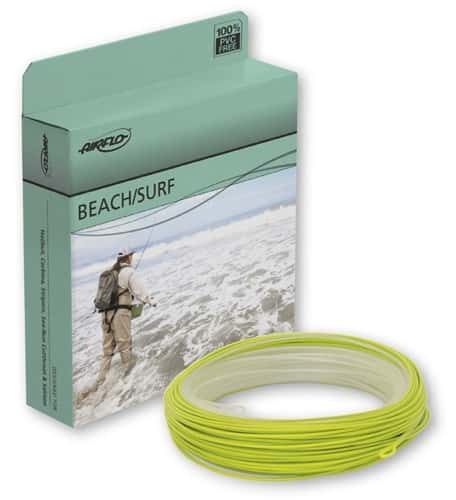 Airflo Beach lines have a condensed head length and aggressive tip diameter to handle longer leaders and heavy flies, and are designed to cast well both single-hand and two-hand rods. Three available densities help ensure that you’re presenting your fly to the fish, not above or below them. I have been fishing this line since November on the Puget Sound. I have it paired with an Echo Ion XL. It casts very well and is very durable. I hardly ever experience line tangles and have fished it even on freezing mornings. I love the intermediate, clear head. The running line is super slick as well. I use the 6 wt. It has handled tons of Sea Run Cutthroats, Cohos, and even a King without an issue. Rajeff knows what's up and designs excellent products.